Ah, the answer to life, the universe and everything. Number 42 of lumiappaday is Plants vs Zombies, a game where you must fight to save your life and avoid getting your brains eaten by zombies using strategically planted plants. I got this game several months ago for my Omnia after reading Andre tweeting about it. I thought it sounded rather silly and it would not be something I could get into. This however became an obsession. I got addicted to playing this game as there’s so much to keep you entertained. There’ an adventure mode where you keep proceeding to a next harder level, unlocking more plants and more zombies, and different levels of which require some planning and strategy as to what particular combination would work the best. On top of that there’s a whole host of mini games to keep you entertained, so if ever you wanted a break you can play these mini games. Completing levels gains you coins which you can use later to buy items that will either help in the main game or in the Zen Garden. I really wish I had more time to share more about this game in case there are those of you that have not tried it. But it’s really amazing. No wonder I saw some petitions asking to get this game ported to Symbian. The game looks absolutely beautiful, so full of colour and detail. The latter, they have put so much attention to it, even the achievements is done wonderfully, being able to dig down further and further underground to see what you have achieved. Being an Xbox Live title, you earn gamer points playing this game. The game premise is simple but Popcap have done so much to spice up PvZ to keep it entertaining. When you think they’ve done everything, they bring out something else completely new. However, even the plain mode of planting sunflowers, collecting sunlight to plan further plants to kill of zombies is still ever so entertaining. Note: In the video I’ve also brought out my Omnia as I’ve completed PvZ on there. PvZ does start quicker on the Lumia due to beefier hardware but it still takes quite a bit to load. Fortunately post mango you no longer need to keep restarting the game. Also the video ends abruptly as I could not stitch on the second part of the video due to YouTube saying the video was too long. Hopefully you guys are already familiar with PvZ. 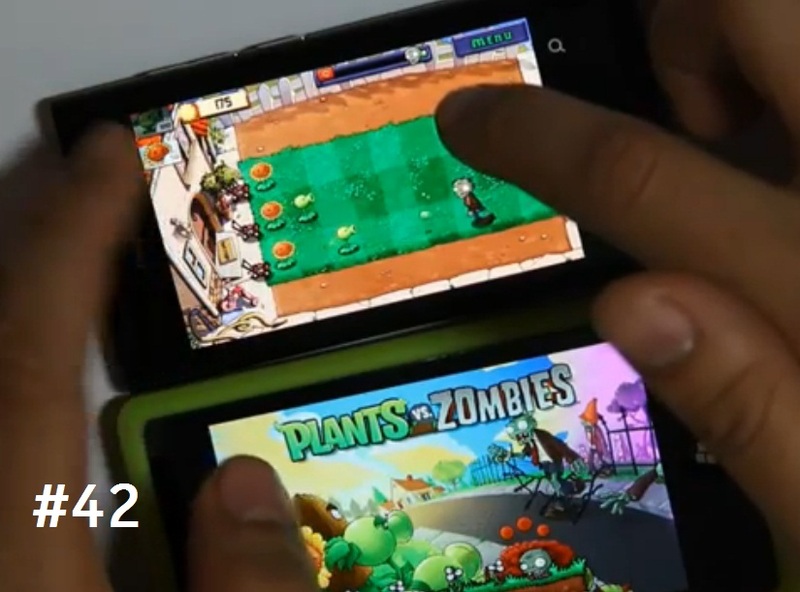 Get ready to soil your plants — Plants vs. Zombies™ is coming to Windows Phone 7! A mob of fun-loving zombies is about to invade your home, and the only defense is your arsenal of plants. Use peashooters, wall-nuts, cherry bombs and more to mulchify 26 types of zombies before they reach your front door. The fun never dies! Conquer 50 Adventure levels — through day, night and fog, in a swimming pool and on the rooftop. Dig into Adventure, 20 Mini-Games, Puzzle mode and the relaxing Zen Garden. Earn 15 in-game achievements to prove your zombie-zapping prowess. Open the Almanac to learn about all the plants and zombies, including amusing “facts” and quotes. Collect coins to buy a pet snail, special power-ups and more. As amazing as it is, £3.99! That’s twice the price on iOS. lolwut? It’s a little off putting. £2.99 would be more ideal. Still more expensive but more acceptable. Everyone needs PvZ on their game hub. If there is any game you should have it’s this. Here’s PvZ on other platforms.